Buying a new home is an exciting milestone for any family. But some of the first residents of the new Cronk Cullyn development in Colby have a couple more reasons to celebrate! Chris and Deborah Beards were not only among the first people to move in to the new Hartford Homes development, but they also became grandparents for the first time this summer. Although the new parents and twins Oliver and Harvey do not live at the property, they do have their own rooms in the five-bed detached home and in the future will be able to enjoy the nearby play area and village green. Chris added “We decided to buy a Hartford home because of their reputation for quality and we are delighted with the finished house due to the high standards of fittings and insulation.” Chris and Deborah also took advantage of the firm’s part exchange scheme, adding that this made the move as easy as possible. Cronk Cullyn is made up of 59 contemporary homes ranging from two-bed bungalows and three-bed terraces up to four and five bed family homes. 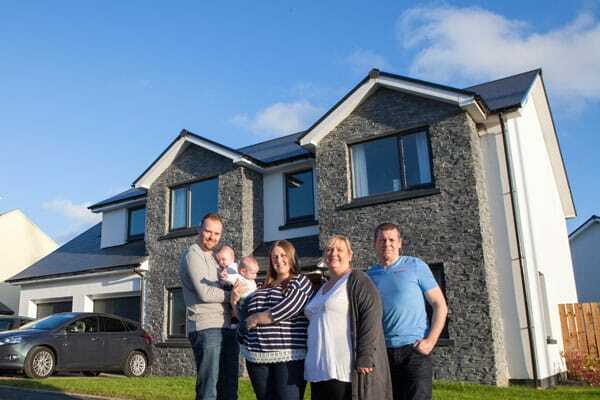 Photo caption: Cronk Cullyn first residents Deborah & Chris Beards photographed outside their new Lancaster home, accompanied by daughter Charlotte Corlett, her husband Lee & their twins Oliver & Harvey.